In the past, a vehicle mounted computer was permanently affixed onto a particular machine, such as a forklift. When the forklift was not in use for any reason, the computer attached to it was idle, as well. 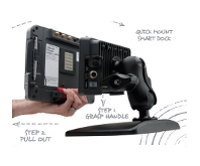 LXE solved that problem with the Quick Mount Smart Dock. The Thor vehicle mounted computer can be removed from one dock to another, quickly and easily, virtually eliminating computer downtime. The Quick Mount Smart Dock can be purchased separately, so it’s not necessary to buy a computer for every vehicle. In a warehouse environment, even the most rugged vehicle mounted computer will break. The abuses that are sustained in shift after shift of hard use means, that eventually the computer will experience downtime due to a broken keyboard or screen. But the THOR features a field-replaceable front panel, which is easily swapped out with only a screwdriver. 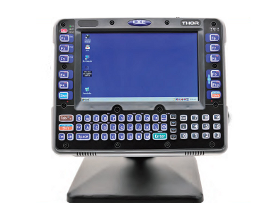 The front panel on the Thor vehicle mounted computer comes with components in a variety of configurations to address different applications, and meet your needs. Swap out keyboard configurations, add a touch screen, a defroster or expand Flash memory without sending the computer out for upgrades or repairs. With other vehicle mounted computers, when you turn the vehicle on, the operator has to also remember to turn the computer on; likewise with turning the unit off. 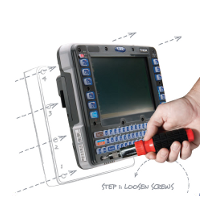 LXE designed the THOR computer to automatically turn on or off when the vehicle is turned on or off, saving the operator valuable time. But, if the unit needs to stay on, or if the operator needs to put it in sleep mode, it’s as easy as pushing a button. The Thor was developed to meet the unique needs of your operation. It is adaptable, enabling on-the-fly customization with a minimum of downtime so you can keep your investment working for you. It’s a leap forward, and the competition will be years catching up! *This article is the opinion of Verified, and not an official LXE document.